I’m thrilled to be today’s guest blogger on SADB! While I may be a far cry from the fashion maven that Lisa is, I have managed to amass a healthy collection of accessories over the years. 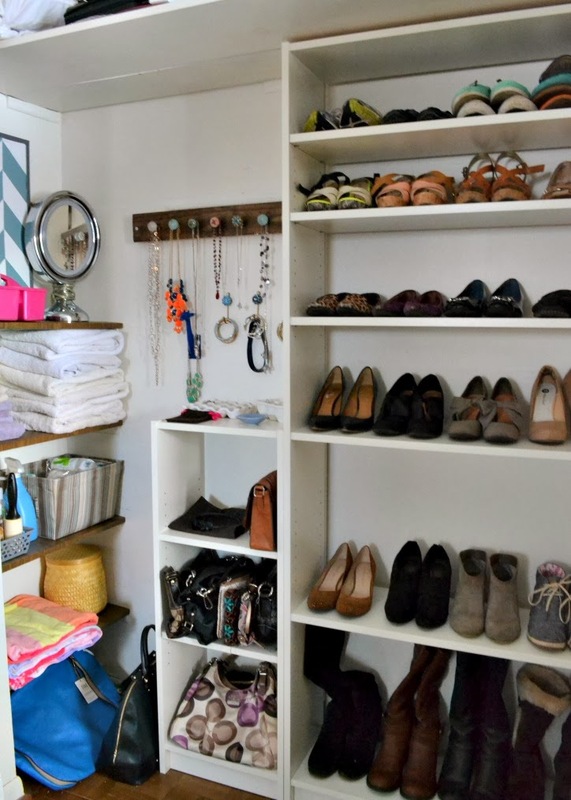 If left unchecked, all those shoes, purses, and jewelry can add up and quickly take over your house! For me to stay organized, everything I own needs to have a home. With a full-time job, a busy home project schedule, a side business in the works, a clingy chihuahua, and a major Netflix addiction, I need to make it as easy as possible for me to keep my house clean on auto-pilot. So I took half of my closet and turned it into an organization station for my various accessories. 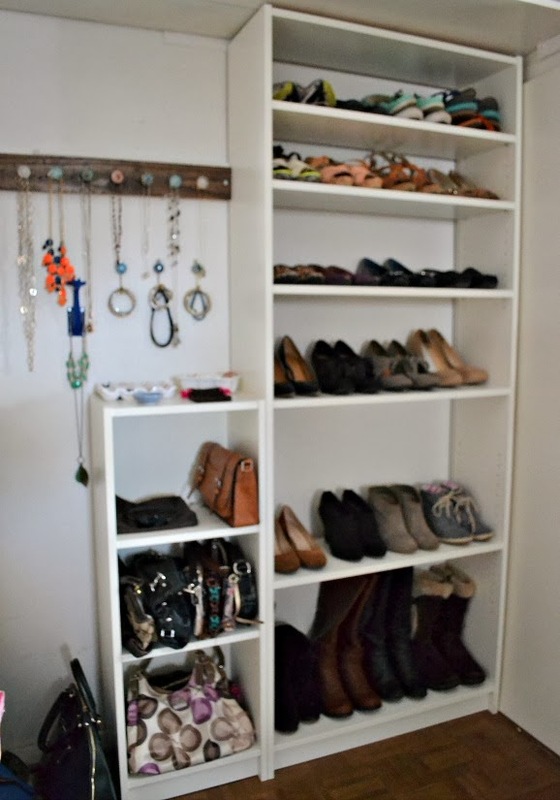 I started with large and small Billy bookcases from Ikea to get a handle on my shoes and bags. I don’t like that cardboard backing stuff, so Ieft that off for now. I’d love to attach some reclaimed wood boards, or even fun graphic wallpaper on the back for a touch of whimsy. Just like accessorizing, decorating should be fun and make you happy! 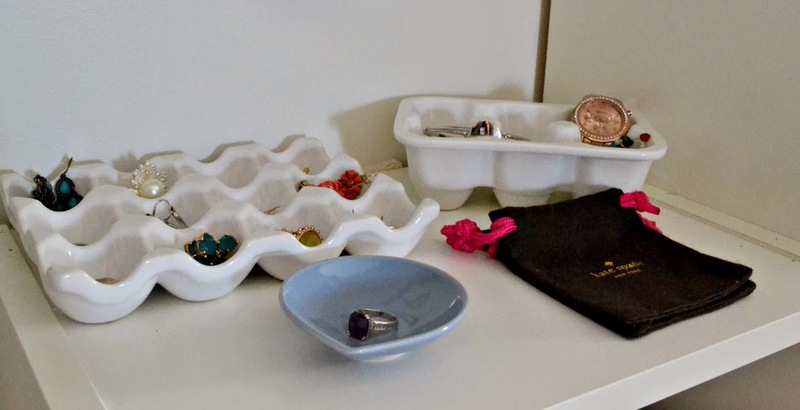 As for my jewelry, I keep my smaller items, like rings, earrings, and watches in these two ceramic egg crates. I love using items in unexpected ways like this. 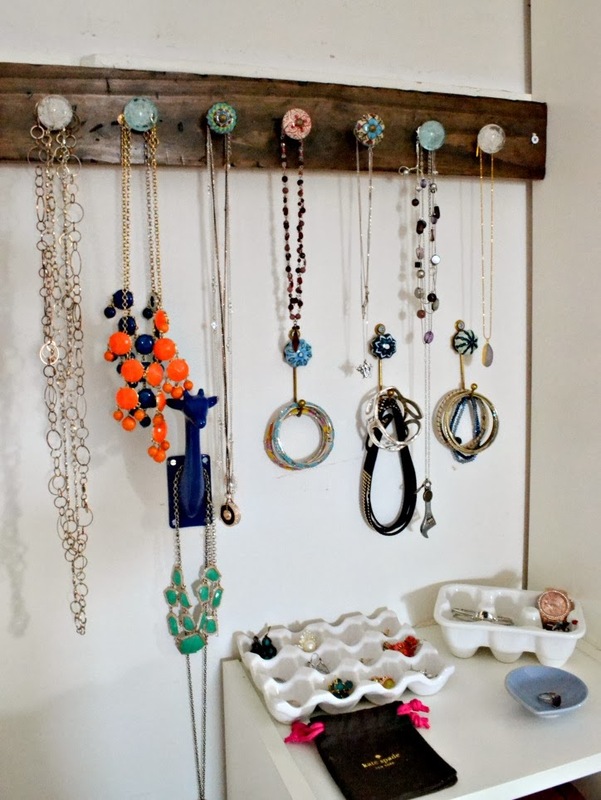 To keep my necklaces organized and tangle-free, I built this simple hook system using a scrap pine 1 x 4 and a variety of drawer knobs I found at World Market. I just stained the board and drilled small holes to accommodate the knobs, then screwed the whole thing to the wall. Easy peasy! And I dare you to find a woman who wouldn’t like a blue giraffe to wear her necklaces for her. Betcha can’t do it. Thanks for taking a peek inside my work-in-progress accessories closet. I love taking my time and letting a space evolve. Looks like it might be time to expand again soon! To see more of my projects, and how I’m renovating and modernizing my 60’s ranch house, visit me over at Double Door Ranch! Thank you so much Lisa for doing a guest post for me! Everyone make sure you head over to Double Door Ranch to see more amazing DIY's and home projects. I love the shelves for your shoes! Great idea! !